Customers who used a cash machine at Cardiff's main railway station are being warned to destroy their cards after a card skimming device was found. British Transport Police are investigating after the cloning device was found at the NatWest machine outside the city's Central Station. It was found on Friday and police say it could have been there for a week. Potentially hundreds of people who used it in that time have been warned to contact their banks immediately. 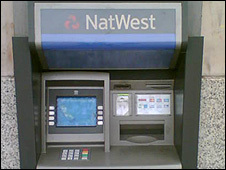 The card reading device and camera on the NatWest cash machine - one of two machines outside the station - was spotted by a member of the public who works with ATMs on Friday afternoon. It was removed at around 1500 BST the same day. Det Sgt Dave Goddard from British Transport Police said: "We would urge people to examine their bank statements with close scrutiny. "The device was found on Friday and could have been there for up to seven days, or less," he added. "We are now forensically examining the device and collecting evidence to try to determine who placed this device on the ATM." He said officers were reviewing CCTV footage from the station and trying to trace any witnesses. "We ask all members of the public to be vigilant when using your cards at cash dispensing machines," added the detective sergeant. "If you do not feel your card is safe or feel suspicious about the ATM in any way, we ask you to inform the bank or contact the police immediately." Warnings were given to passengers on some services. Arriva Trains Wales said as far as they know, the machine was now working properly again. A spokesperson for NatWest said: "This type of fraud is an industry wide issue, which can affect all UK banks. "We are working closely with the police in the area and APACS (the UK payments association) to combat this crime. It is not isolated to a particular area or a particular bank."